Yes, comfort food can be low-carb! This vegetable-rich soup is not only healthy and easy to prepare in your Instant Pot, but also hits the spot. 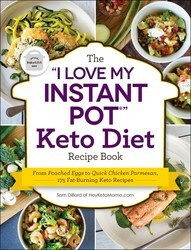 Check out the recipe for Chicken Zoodle Soup, which is one of the many delicious meals you can find in the “I LOVE MY INSTANT POT” KETO DIET RECIPE BOOK by Sam Dillard. They say that chicken noodle soup can cure just about anything. 2) Press the Sauté button and add the coconut oil to Instant Pot®. Once the oil is hot, add mushrooms and onion. Sauté for 4–6 minutes until onion is translucent and fragrant. 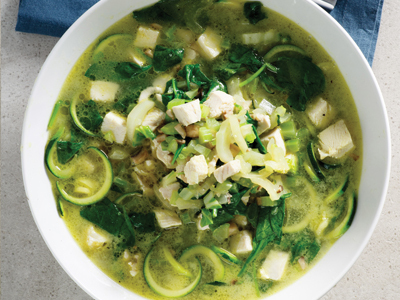 Add celery, jalapeños, bok choy, and spinach to Instant Pot®. Cook for additional 4 minutes. Press the Cancel button. 3) Add cooked diced chicken, broth, bay leaf, and seasoning to Instant Pot®. Click lid closed. Press the Soup button and set time for 20 minutes. 4) When timer beeps, allow a 10-minute natural release, and quick-release the remaining pressure. Add spiralized zucchini on Keep Warm mode and cook for additional 10 minutes or until tender. Serve warm. COLD FIGHTER: This soup is a great alternative to chicken noodle and the cayenne kick is excellent for clearing out a stuffy head. A squeeze of lemon juice makes for a tasty addition with some vitamin C.
Hungry for more Instant Pot recipes? You’ll want to try this one for Spinach and Feta Stuffed Chicken.